One hundred and four readers love this post. Move over, pumpkin pie! We’ve got something even better to try this holiday. Combine flour, baking powder, salt, sugar and spices in a medium bowl and blend. In a separate bowl combine pumpkin puree, milk, butter and vanilla and blend. Add wet ingredients to dry ingredients. Spread evenly in greased baking dish. 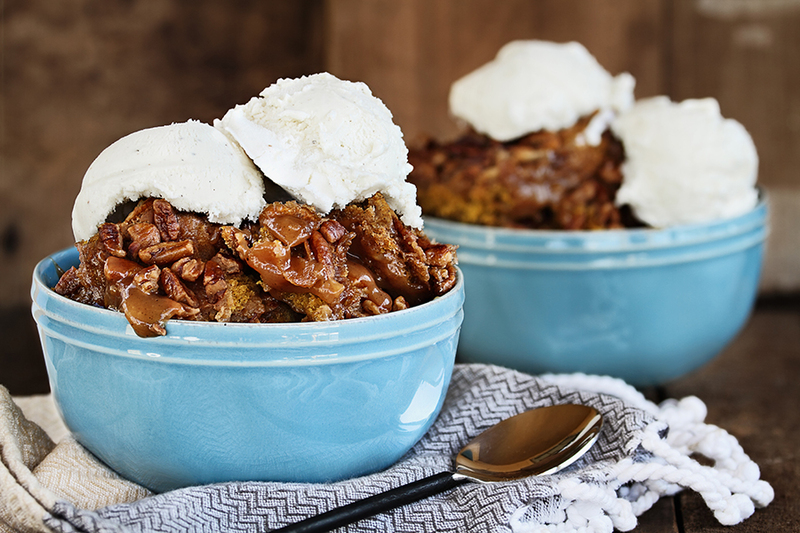 In another bowl, combine sugar, brown sugar, and pecans for the topping. Sprinkle topping over pumpkin mixture. Pour hot water right on top. DO NOT stir. While your cobbler cools, combine brown sugar and liqueur for the reduction. Simmer over medium heat until it reduces by half. To serve: Scoop out a piece of cobbler. Top it with vanilla ice cream. Drizzle with pumpkin spice reduction.